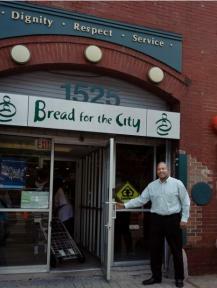 Since 1976, Bread for the City has served homeless, indigent and impoverished families in Washington. Bread for the City serves more than 2,500 clients each month providing an array of supportive services including food, clothing, medical and dental care, legal services and case management. The main office is located in a small building, a former warehouse, on 7th Street in the Shaw community. The facility houses the food pantry, dental and medical laboratory and offices, offices for social workers and other service providers. With its large caseload and broad program offerings, the small building of 9,608 square feet was literally bursting at the seams, and Bread was forced to incur the expense of renting nearby space for its administrative staff. In 2009, with a grant from the DC Primary Care Association and financing through the City First New Markets Tax Credit program, City First originated a loan of $6.4 million using proceeds of the equity investment by U.S. Bancorp Community Development Corporation. In October 2010, Bread for the City began construction of an 18,000 square foot addition on the parking lot next to the existing facility and completed substantial renovations to the existing clinic. The new facility allows Bread for the City to serve an additional 2,000 clients per year, double its food storage and distribution capacity and offer a wider array of services for the homeless individuals it serves.